I have started to convert the nursery into a big girl room. 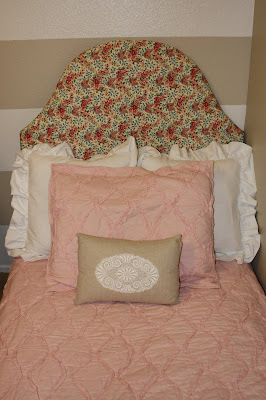 and some ruffled pillow shams. This one took me about 1 hour. some plywood, and my hubby cut it out for me. Stay tuned for the final big girl room reveal next Thursday! With pictures, tips, and a price breakdown. I'm so excited to make a big boy bed when my little guy graduates from his crib. I am totally going to make a boy version! Great idea! Can't wait to see it all completed!